The religious right has been in decline for years. Can progressives build a new "moral majority"? In June 1979, a coalition of conservative religious leaders led by a Jewish Howard Phillips, Catholic Paul Weyrich, and evangelical televangelist Jerry Falwell banded together to wage a political "holy war" against the liberal establishment. They called their organization the "Moral Majority" to signify the large number of social conservatives they believed were being ignored across American culture. 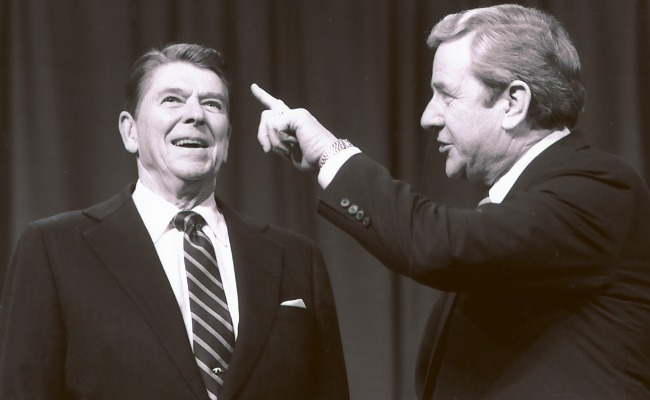 Forming a political action committee, the organization registered 4 million voters in 1980 and purchased $10 million in radio and television ads questioning President Carter's patriotism and Christianity. Its message struck a chord with a large swath of Americans, and their efforts are credited with helping to elect Ronald Reagan. More importantly, the birth of the coalition began of a period of political dominance for the religious conservatives that would span at least three decades. But according to a new survey by the Public Religion Research Institute (PRRI) in partnership with the Brookings Institution, the religious balance of power is shifting in ways that could make the religious left the new "Moral Majority," figuratively speaking. If current trends persist, religious progressives will soon outnumber religious conservatives, a group that is shrinking with each successive generation, the data show. PRRI reports that 23 percent of 18- to 33-year-olds are religious progressives, 17 percent are religious conservatives, and 22 percent are nonreligious. By contrast, only 12 percent of 66- to 88-year-olds are religious progressives, while about half are religious conservatives. The survey used a religious-orientation scale that "combines theological, economic, and social outlooks." 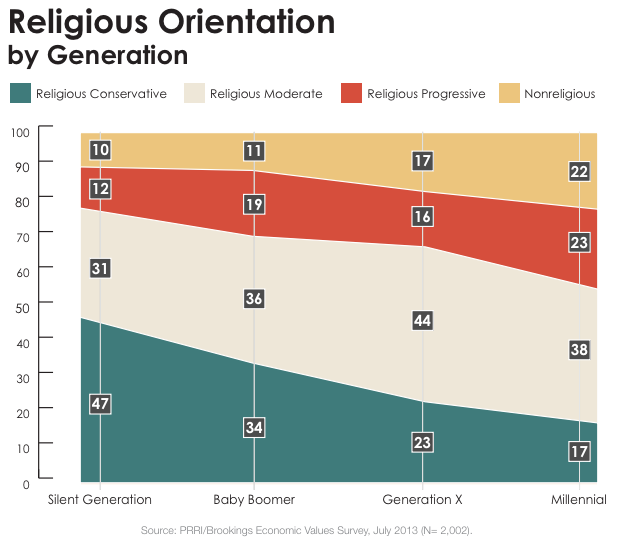 "What you clearly see in the data when you move from the oldest Americans to youngest Americans is a stability among religious moderates and decreased appeal in religious conservatism," says PRRI CEO Robert Jones. One might assume that the increasing diversity of the population is a driving factor in the shift, but Jones says this is not the case. African-Americans tend to be theologically conservative -- 49 percent, as opposed to 14 percent who are liberals -- but are more progressive on economic and social issues. Hispanic Americans are far more likely to be religiously moderate, and they don't tip the scales one way or the other. "It's mostly age," Jones says. "Younger whites, whose parents were far more conservative, are the ones who look significantly different." Progressive religious leaders seem predictably pleased. David Gushee, a professor of Christian ethics at Mercer University and author of The Future of Faith in American Politics who describes his political instincts as center-left, says he is neither surprised nor disturbed by younger generations' progressive tilt. "I am generally glad, at least in terms of hope for progress on justice and peace issues that I care a whole lot about," Gushee says. "Much of what goes out under the name of Christian conservatism I find odious, so there is not a lot of grief in this office today about the new data." Gushee believes conservative evangelicals need to come to terms with their fading constituency and with the "impossibility of 'taking back America' for their vision at least as it currently exists." Lisa Sharon Harper, director of mobilizing for Sojourners, a progressive Christian organization, says shifts are due to young people choosing to identify with Jesus and his teachings as opposed to a particular political party. Harper believes the GOP is being pulled to the far right by extremists on issues like abortion, thus forgetting and alienating those whom Jesus affirmed and advocated for: poor people, ethnic minorities, and women. "I think the focus on the person of Jesus is birthing a younger generation inspired by [Jesus' Sermon on the Mount]," she says. "Their political agenda is shaped by Jesus' call to feed the hungry, make sure the thirsty have clean water, make sure all have access to healthcare, transform America into a welcoming place for immigrants, fix our inequitable penal system, and end abject poverty abroad and in the forgotten corners of our urban and rural communities." Though Harper might dispute it, many would argue her list sounds like a liberal wish list. It's certainly at variance with the agenda of many conservative Christians, which would include opposing abortion and gay marriage and protecting religious liberty. It is also perhaps emblematic of the way the growing numbers of religious progressives are thinking. So how can we expect these shifts to affect American public square? Will religious progressives cohere into a political movement like their conservative counterparts did in the late 1970s and 1980s? Will the religious left become the next "Moral Majority"? Jones says it's too early to tell. A constituency in itself does not a "movement" make. The latter depends on infrastructure, organization, and leadership, elements that American religious progressives have not been able to produce -- despite various attempts -- on the scale that the religious right has. Religious progressives face three hurdles to morphing into a true movement, Jones says. They are more ethnically diverse than conservatives, so they have fewer natural affinities than their counterparts on the right. They are also more geographically dispersed across America. Conservatives, on the other hand, are heavily concentrated in the South and Midwest, which makes for easier mobilizing. And finally, progressives are more religiously diffuse, which is to say that religion is only one of many influences shaping the way progressives think and behave. Meanwhile, it's difficult to interpret the erosion of conservatism among young religious whites as anything but bad news for the latter-day leaders of the religious right like Ralph Reed and Tony Perkins who rely heavily on that demographic. If the data are correct, these leaders' dominant days may be ending sooner than expected. Not every conservative religious leader is sweating it. Russell Moore, the recently elected president of the Ethics and Religious Liberty Commission of the Southern Baptist Convention, says he doesn't put much stock in surveys like PRRI's. He believes that the type of religion that survives and shapes cultures shows up in local congregations. "Congregationally speaking, Protestant liberalism is deader than Henry VIII. While survey after survey shows a secularizing American population, this hasn't helped the growth of liberal Protestant churches," he says. "Where are the Unitarian mega-churches, the Episcopalian church-planting movements?" Moore doesn't believe religious conservatives, particularly Christians, are fading. But he does think they will be culturally marginalized in the future. "We will seem increasingly conservative," he says, "not because we are passing out voter's guides but because we believe in such culturally incredible things as that every life matters, that marriage is a permanent one-flesh union of a man to a woman, and, above all, that Jesus of Nazareth is alive, and Lord." Moore's predictions may be right, but for now we only have data. And the data indicate that the growth of religious progressives may soon shift a balance of power that has existed for more than a quarter century. The conservative faithful will continue to have a voice in the public square, at least for some time. But now they'll have to learn to sing in harmony, rather than solo.